The La Center-based small farming business hopes to bring communities closer to the source of their food. LA CENTER — When the food you eat comes fresh from the garden, not only does it taste better; it is better for you. This was the simple idea that drove Mark Lopez, a Battle Ground resident, husband, father, and business owner, to rethink where he sourced the foods for his company, Crave Catering. It began with tomatoes. A self-described “tomatoholic,” Lopez began growing his own tomatoes at his former Battle Ground residence and giving away the extra produce to his co-workers and employees. When he came to the realization that he could be home-growing some of his catering company’s supplies, the pieces began to fall together. Gather and Feast Farm was founded in 2017 by Mark Lopez, owner and operator of Crave Catering, as a way to produce fresh ingredients for his business. The farm has since taken on a strong presence in the Clark County community, hosting various dinners, a wedding, and other events. Photo courtesy of Gather and Feast Farm. Lopez, his wife, Nicole, and son, Zak, moved to a 20-acre piece of land near La Center in 2017, where Lopez’s dream became reality in the form of Gather and Feast Farm. Currently, the farm grows over 60 varieties of tomatoes, and also produces kale, swiss chard, and various spices, and herbs, including 10 different types of mint. In addition, an orchard on the property grows a plethora of cherries, apples, and pears. The mission of Gather and Feast Farm is not only to produce fresh, area-grown food; Lopez also makes it a priority to engage the community to show friends, neighbors, and Clark County businesses the benefits of locally-sourced produce. 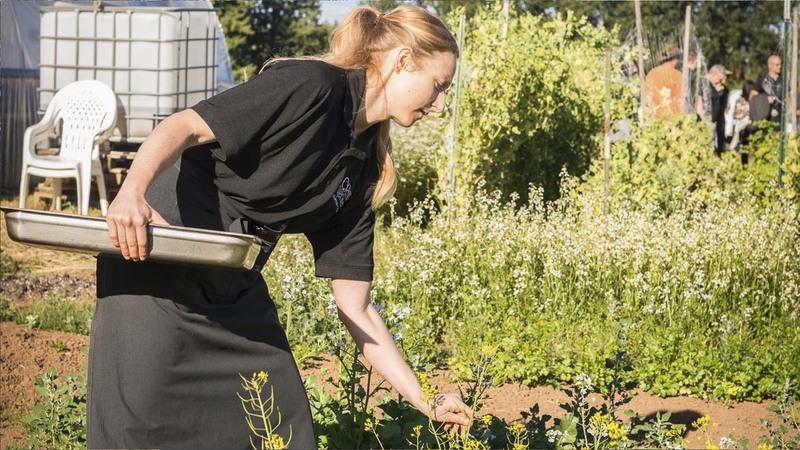 As a result, Lopez has partnered Gather and Feast Farms with Slow Foods Southwest Washington, an organization that brings small, regional farming businesses together with restaurants and caterers who want to serve their products. Gather and Feast Farm’s summer Farm Dinners give area residents the chance to experience Clark County’s farming community partnerships. Photo courtesy of Gather and Feast Farm. It is through this organization that Lopez has been able to host a pair of “Farm Dinners” this summer, which took place on June 23 and Aug. 11. According to Lopez, these dinners were specifically designed to promote a sense of community around the small farm setting and to help people think more about where their food comes from by bringing them closer to the source of the food they eat. When guests arrived on the evening of Aug 11 for the farm dinner, they knew right away that they were in for a treat. Even at $125 per person, the dinner was well worth the price of admission. Lopez and company first welcomed diners to congregate under what he affectionately calls “The Gathering Tree,” an old-growth maple tree on the property. 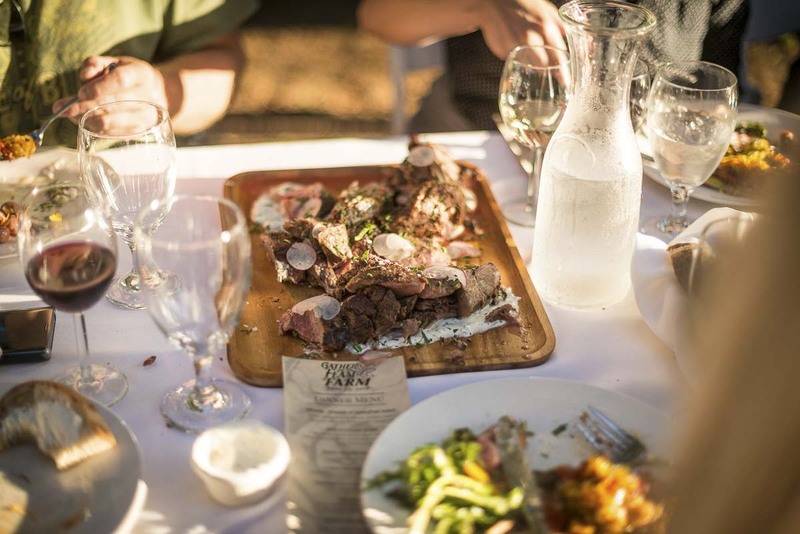 It was here that each Farm Dinner kicked off with hors-d’oeuvres and beverages, which were provided by Slow Foods partners Koi Pond Cellars and Brothers Cascadia Brewing at the most recent dinner on Aug. 11. After the cocktail hour, Lopez makes it a point to take each group of visitors on a tour of the farm, showing where and how their food for the evening is produced and introducing them to his dog and brood of chickens. When dusk approached and the time for dinner arrived, guests were ushered into an outdoor seating area with light strings running through the trees above. The dinner itself was nothing short of spectacular, with one of Clark County’s most widely-praised chefs, Capers Ogletree of The Eatery at the Grant House, cooking up the meal. 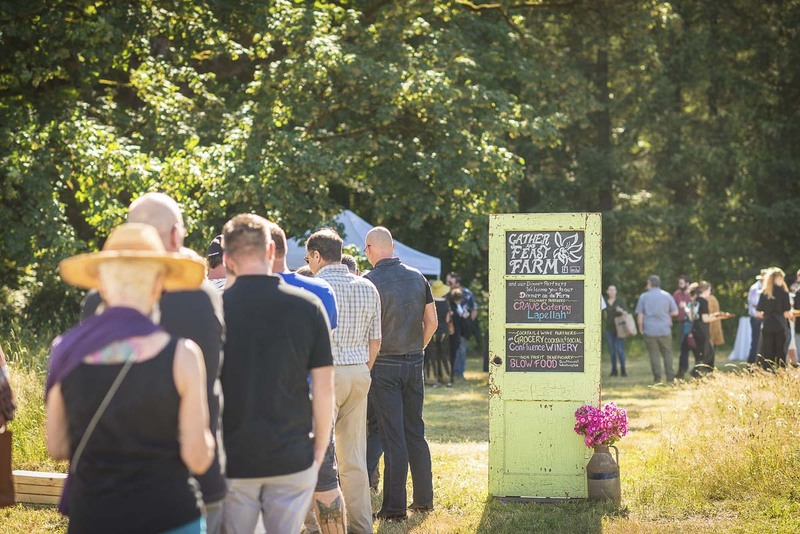 The Farm Dinner on Aug. 11 featured area-sourced ingredients, beverages from Koi Pond Winery and Brothers Cascadia Brewing, and a meal prepared by Vancouver’s very own, Chef Capers Ogletree. Photo courtesy of Gather and Feast Farm. Even though Gather and Feast Farm is only in its second year of operation, the strong work ethic and ambition among Lopez and his employees could fool anybody into believing that the farm has been around for many years, and they show no signs of slowing down. Lopez hosted the farm’s first wedding in May, but after all of the preparing and construction he did for the event, he hopes to be able to host more. Beyond growing fresh produce and hosting dinners and weddings, Lopez says his eventual goal is to partner with other small regional farms to establish a processing plant on the property so that he and other like-minded sodbusters can save, process, and preserve more of their produce. His reasoning for such comes down one simple reason; the same that inspired him to found Gather and Feast Farms and host the summer Farm Dinners in the first place.